“In this competition, we aim to provide students a chance to apply the accounting knowledge that you have learnt in school. This is to help you gain experience, knowledge and strength that will better prepare you for dealing with the challenges of life in or out of the accounting and finance industry. This competition is also an initiative where we hope to encourage you to leverage your knowledge in the accountancy field, gain a better understanding of a career in accounting and the rewarding career opportunities available,” said Dr Elizabeth Lee, Senior Executive Director of Sunway University and Sunway Education Group in her welcome speech at the Malaysian Institute of Accountants (MIA)-Sunway TES Accounting Quiz 2014 finals. 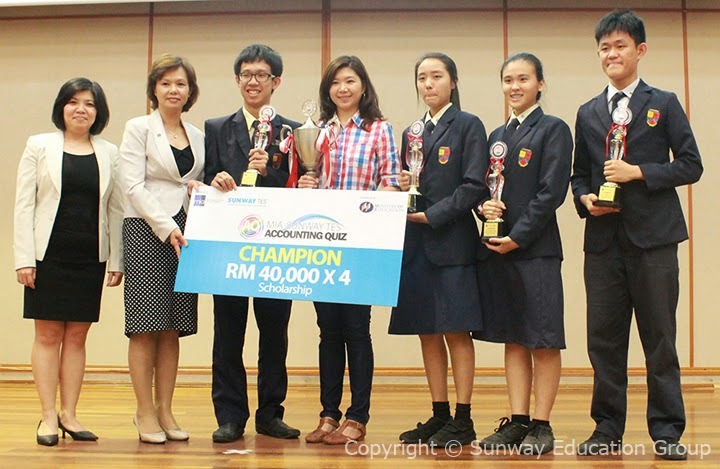 The competition began in April with the participation of almost 1,000 teams comprising of more than 3,500 students from schools across Malaysia. 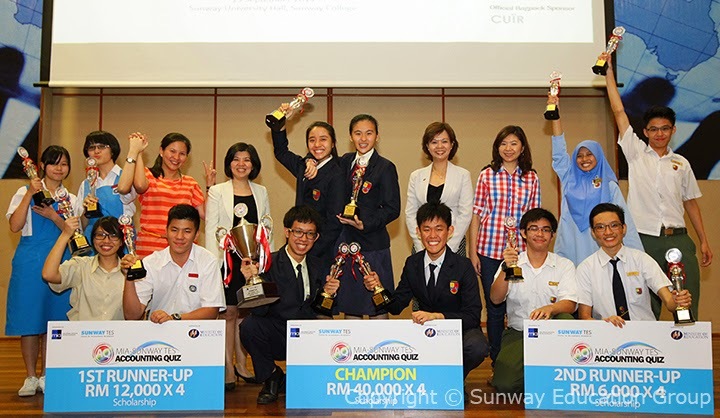 After various qualifying rounds, ten teams competed in the finals which was held at Sunway College. Elite of 13 from SMK USJ 13 came out first while Revenue of SMK Bandar Puchong Jaya (A) and Team Leaf also of SMK USJ 13 came out first runner-up and second runner-up respectively. The three teams receive scholarships worth more than RM200,000 to further their studies in accountancy at Sunway TES. Liaw Chia Yoong, Elite of 13 team leader said of his experience, “Taking part in this quiz is a wonderful experience, stressful but worth it”. Liaw together with his team members Huong Sue Yuen, Ching Wen Ning and Janice Kung Shu-En, and members of the Team Leaf are science students who took up accountancy as an additional subject. “We truly enjoy accountancy as the concepts are interesting and easy to understand. We worked hard and were well prepared for the final. Our parents, teachers and friends have been very supportive”, Liaw explained. Guest of honour at the event include Tuan Haji Anuar Abdul Hamid Senior Principle Assistant Director of Co-curricular and Art Division from the Ministry of Education; Ho Foong Moi, CEO of the Malaysian Institute of Accountants (MIA). The event was sponsored by The Institute of Chartered Accountants in England and Wales (ICAEW), BDO, Crowe Horwath, Deloitte, Ernst & Young, Gow & Tan, Khairuddin Hasyudeen & Razi (KHR), PricewaterhouseCoopers (PwC) and Salihin Consulting Group. Congratulation on winning the accounting quiz. When I was a student of accounts in Zicklin School of Business, there Aloke Ghosh was my professor. He helped us in every way to win number of accounting quiz’s. He was one of most popular and experienced professor of my college.